You know I adore my friend Shenlei. She is a dynamo, never relaxing, never stopping, one brilliant creation after another. If I want to get to have playtime with her anymore, I practically have to kidnap her. *grin* I think I need to drop another “time-to-play-and-laugh-for-30-minutes” present on you, Shen. When last we saw our heroine – she’d just published a book. Okay, she topped that. 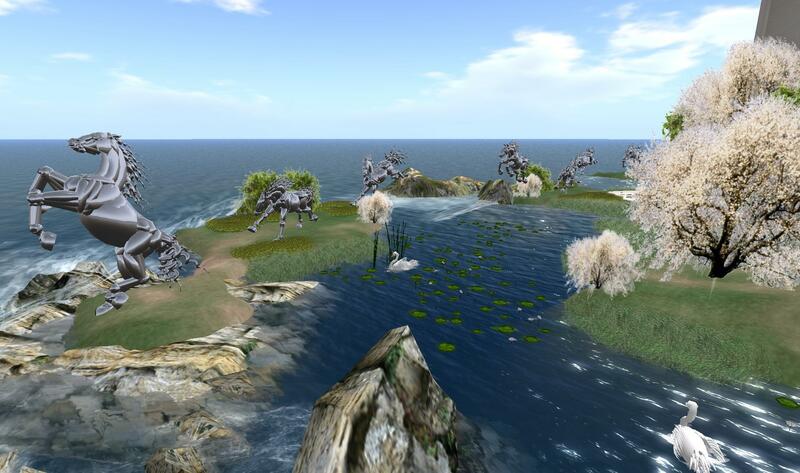 She built 4 regions in Opensim. Yep. Four. Gorgeous, prim-full regions. /me grins happily. I have been there twice already, visiting, seeing the sights. 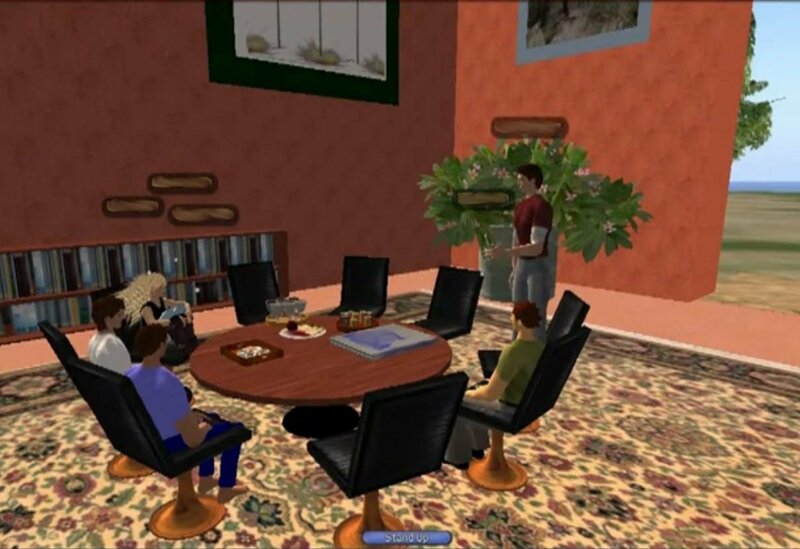 Fashion Research Institute, Inc. and Intel Labs announced their new research collaboration whose focus is exciting, quality content and optimized performance of the OpenSim platform which, together, will provide for an enhanced user experience. Maybe you don’t know how truly exciting this is. 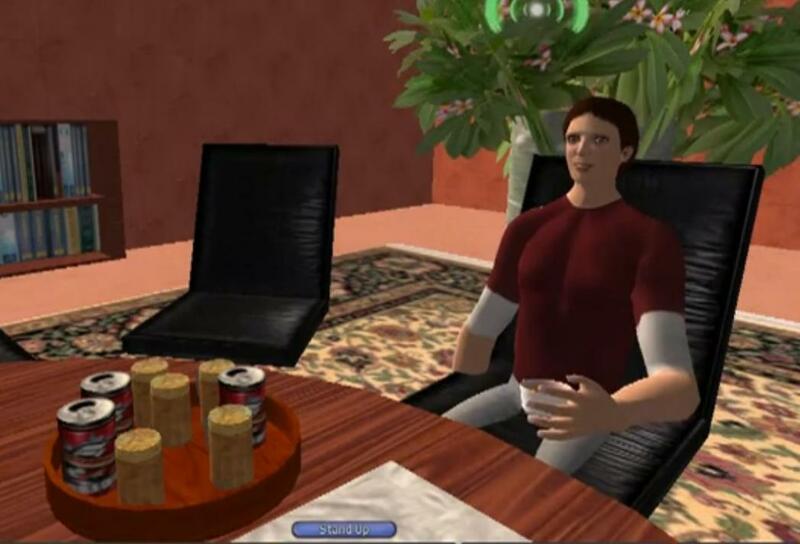 Maybe you don’t play in virtual worlds. Maybe you only play in SL. 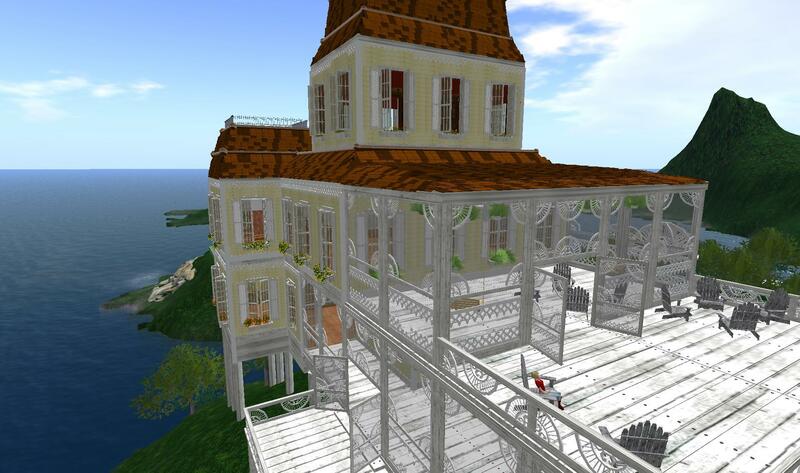 But as one who has been working in Opensim for the last several months – believe me. This is MAJOR. The efforts being made on Science Sim for both content and performance are huge. You know I am not a techie, I’m not really anyone who “knows” much. I am your typical end user. So what I say reflects the masses, not the cognoscenti. These sims are stunningly beautiful. Fascinating to visit. I think that we are looking at another major step in OS’s rise to fame and glory. *grin* Okay – maybe that was over the top. But since I am NOT technical, I do fall back on my liberal arts upbringing. This collaboration is currently scheduled to run for a year, during which time FRI will provide increasingly complex, highly detailed, large scale (beautiful) designs which will be showcased in Science Sim with hosting and hardware provided by Intel Corporation. We think it is important to have active human agency providing feedback to the technologists about the quality of the user experience. As fashion designers from the apparel industry, we think function should also be delivered with flair, and dare we say it, fashionably. With that in mind, we have begun developing the new Shengri La regions on Science Sim: Shengri La Chamomile, Shengri La Sage, Shengri La Thyme, and Shengri La Rosemary. There is a wonderful video on the front page of the FRI blog. It highlights the Chamomile region. The hauntingly beautiful music is by Kyle Bronsdon (who you may know as Kyle Beltran), and was composed specifically in honor of Shenlei and Shengri La. At the moment there are sailboats and gardens and landscaping and the stupendous Saltwater House. 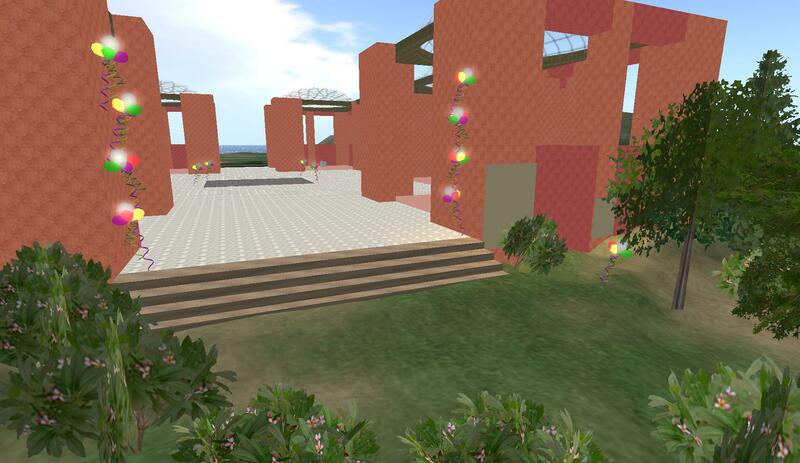 Also there or coming shortly are works by the FRI interns (hey – they are doing a fashion show in SL in 2 weeks – *grin* you know *I* will be there) and interactive butterfly displays and much more. There is also an art gallery coming, but I’m not allowed to say anything more about that. (Contact me in world – I can be bribed. *grin*) I snuck over and could not resist taking this picture of the grounds about the building. 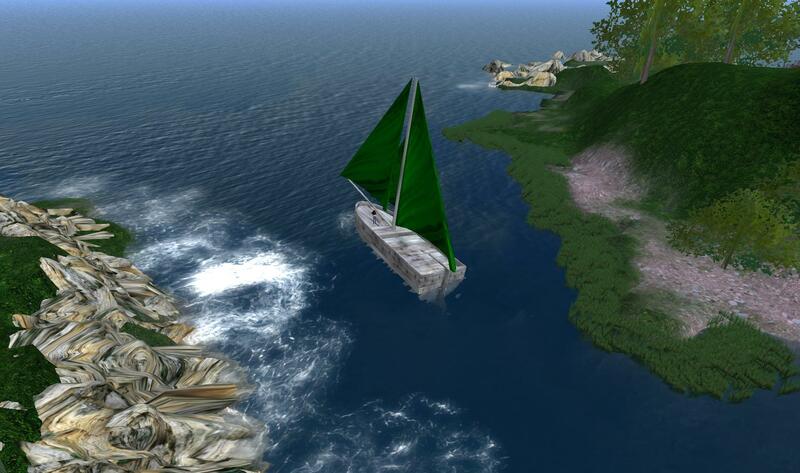 Opensim can be a beautiful space. 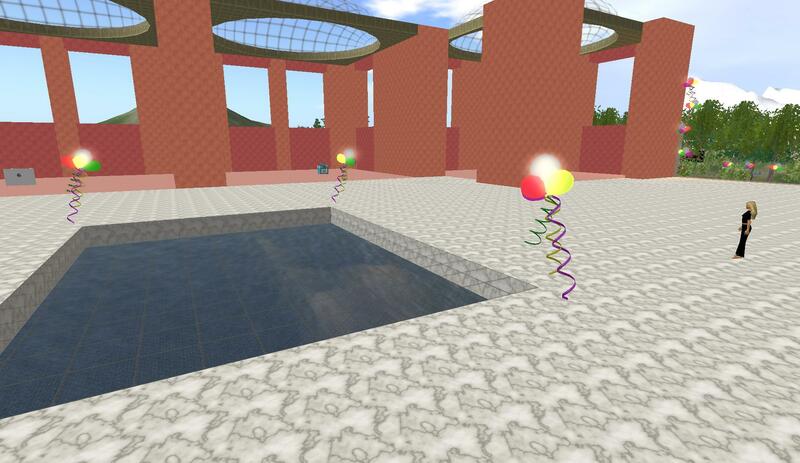 “My” opensim mall is ready for tenants. 🙂 If ever there was a misuse of a pronoun, my first word is that misuse. “My” mall is not really mine, of course. It belongs to work, to my co-workers. Not only is it not mine, but I didn’t build it either. Let’s see…. for what CAN I take credit/blame? I picked where it would sit in the sim. I modified the original proposal, reducing the size. I solicited comments from the future tenants and passed those comments to the builder. I supplied the textures. (Well, we could actually say that isn’t true either. A dear friend GAVE me several textures, knowing for what they would be used, but said that we could have them free and clear. So I supply textures much as I build trees. With help!) And, of course, the color scheme is MINE!!! We (the committee of three) were putting the finishing touches on the mall the other day, just before I posted the notice that vendors could come stake out a store. We put out balloons to welcome everyone. 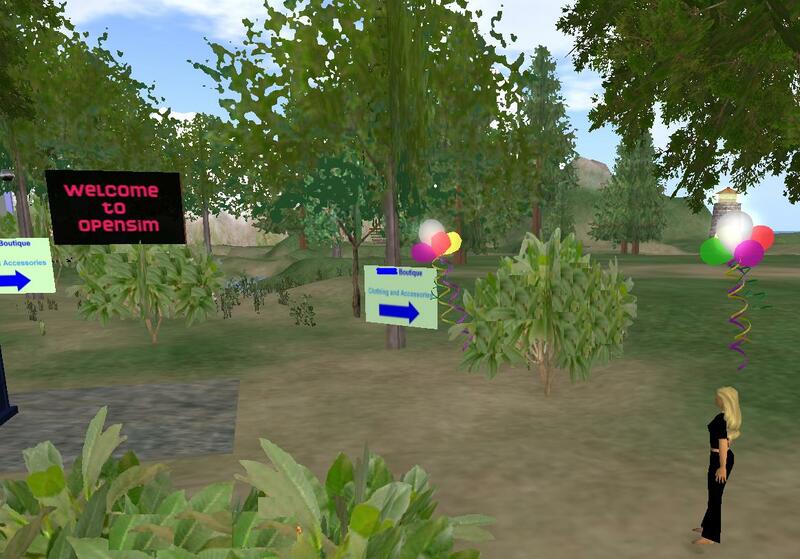 We put up signs to show people the way from the entry point to the mall. We covered the pond in the middle so that people wouldn’t fall through. Oh my, did we have trouble with OSHA and the local code officer. /me sighs I considered bribing them, buying them off, but that is soooooooo against company policy. They objected to no railings, to failure to comply w/ ADA, lack of bathrooms, steps the wrong dimensions, lack of sprinklers….. You get the idea. I looked at them. I looked at the money sitting in my bank account. I looked at them checking off violation after violation. I did what any sensible landlord would do. I shot them! LOL Hey – this is MY fantasy world. I get to have a little fantasy here. Anyway, after we had the building looking spiffed up and ready for prospective vendors, I took a few snapshots. I passed one of them to a friend who is a very good builder. She approved the build. But then she added that I “might want to find some colors that are a little different”. I started laughing and told her “I picked the textures”. She said “I’ll shut up now”. Ah, you never have to shut up. I’m a big girl. I can take it. And besides…. I did tell the vendors that they could change the inside colors. 🙂 Of course, *I* don’t know why ANYONE would want a DIFFERENT color, but there you have it. I don’t know what will happen with this mall concept. 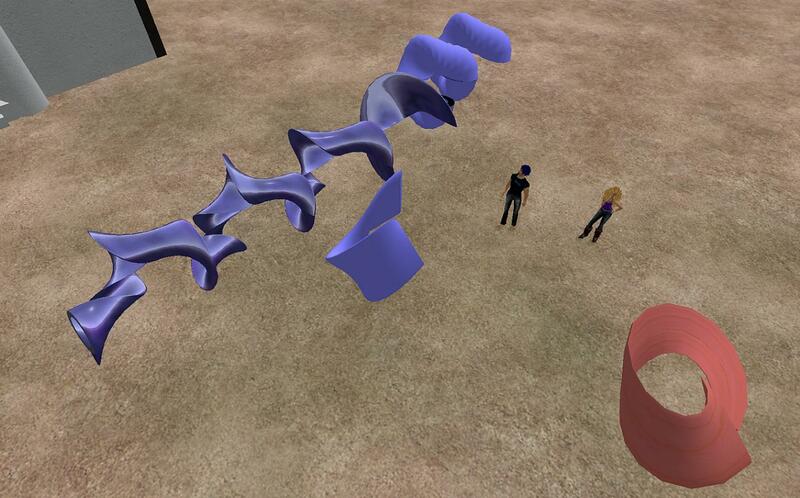 I think that most of the people in this opensim really don’t have time to do much in the way of being retailers. Not only that – everything is free. The wares are being “sold” for $0. The purpose is to add content and pleasantness to OS. I have 8 stores available but only 38% occupancy. Good thing that I don’t have to pay tier, or this mall would be closing for sure. What’s my personal interest in all of this? (1) Learning. This process has made me much more interested in learning about textures and building. The mall needs railings and chairs and tables. 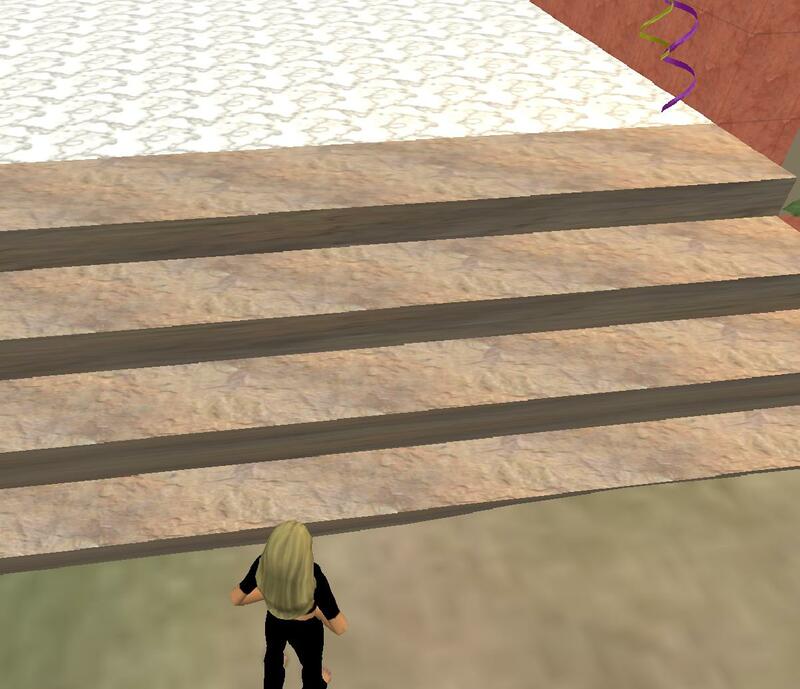 I made the stairs and learned a lot about repeats of texture patterns. I also had to do some more terraforming. Now THAT is definitely an acquired skill. I need more practice for sure. 🙂 (2) Friends. I love meeting new people. Jaymin – you are a joy! Thank you and thank you again. Not only are you kind and helpful and encouraging – you make me laugh. I enjoy your sense of humor immensely!! (3) I’m REALLY hoping that SOMEONE puts up a decent AO for ‘sale’. I simply cannot STAND how Summer walks. Sigh. This must be why everyone else chooses to fly. I don’t like flying. I like to walk. *grin* With the appropriate AO. AO, skin, hair, boots. In that order!!! !